Nappy hair can be a trendy style that makes every girl envious. However, it’s essential to take the proper steps in order to make it look glamorous. 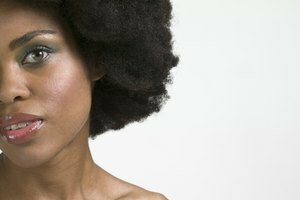 Creating nappy hair that looks teased to perfection isn’t really all that difficult. In fact, it can be easily achieved by following a few simple tips. Apply volumizing gel to damp hair that has just been towel dried. Start at the roots and work your way to the ends. Roll hair in medium- to small-sized curlers. The hair should be left to set in the curlers until fully dry. This can take approximately two to four hours. However, for extra volume, leave the curlers in overnight. Remove the curlers and carefully flip your head upside down. Spray a light volumizing hair spray on your hair. Flip your head back up and gently work your fingers through any areas that look overly tangled. Use a teasing comb to tease the roots of your hair, giving it a lift. This process may take a couple of minutes depending on how thick or long your hair is. Choose a hair style. A nappy hairstyle looks great down. However, you can tame it up a bit by putting it in a loose ponytail, leaving the roots teased high on the top of the head. A loose side ponytail works as well.